Education Secretary Arne Duncan and OVAE Assistant Secretary Brenda Dann-Messier have recently met with students involved with the criminal justice system both to better understand their educational experiences and to inform work of the Department in the areas of correctional education and prisoner reentry. 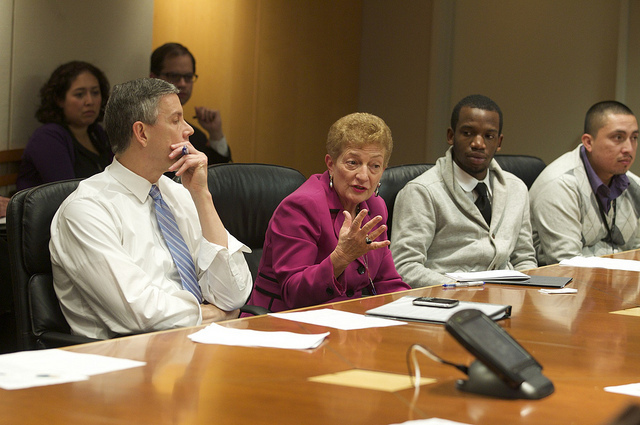 Pictured above are Duncan and Dann-Messier speaking this November with D.C.-area students in the corrections system. The Department’s blog for Dec. 10, 2012 carries a posting, about the Student Voices work, of which this was a part: http://www.ed.gov/blog/2012/12/back-on-track-after-being-behind-bars/. 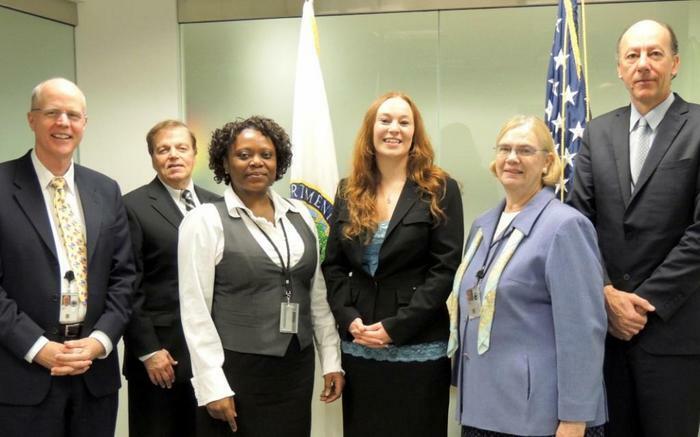 In the photo below, Starcia Ague (third from the right)—who was incarcerated from the ages of 15 to 21—is pictured at a meeting this December with OVAE staff to discuss how facility-based educational experiences shaped her development and enabled her to move into a successful adulthood. Ague is a passionate advocate for college opportunities within correctional facilities. Her autobiographical piece “Trouble to Triumph, Fighting for Education Equality as an Incarcerated Youth” was published this month in a special edition of the Harvard Educational Review “Disrupting the School-to-Prison Pipeline.” Pictured with Ague are, left to right, John Linton, Hugh Reid, Zina Watkins, Carolyn Buser, and OVAE Deputy Assistant Secretary Johan Uvin. OVAE has a nearly $1 million discretionary grant competition under way for reentry education projects, with the expectation of awarding two to four grants. The deadline for applications is Wednesday, Dec. 26 at 4 p.m. EST. Grants will be awarded in January 2013. MDRC, a nonprofit, nonpartisan education and social policy research organization dedicated to learning what works to improve programs and policies that affect the poor, recently announced its participation with New York City in the nation’s first Social Impact Bond program. It is an innovative means to fund promising new programs at no cost to taxpayers until improved social outcomes are proven to have been achieved. The groundbreaking program, Adolescent Behavioral Learning Experience (ABLE), is a cognitive behavioral therapy program for 16- to 18-year-olds detained at Rikers Island. Nearly 50 percent of adolescents who leave custody from the New York City Department of Correction at Rikers return within one year. The principal goal of ABLE is to help these youths stay in school, and find and keep a job thereby reducing the high recidivism rate by emphasizing personal responsibility, education, training and counseling. This innovative funding structure was first initiated in Great Britain two years ago. It is an investment vehicle designed to encourage private investment in the scaling up of evidence-based program innovations that have demonstrated potential to return a positive benefit to the public sector. Once a third-party evaluation confirms that the services have delivered an agreed-upon outcome, the government reimburses the original investors. These programs are designed to find new ways to finance human services initiatives that might save governments money over the long term. As such, work from this new initiative and its outcomes may be particularly useful to service providers, including adult education and correctional education providers. Working with the New York City Mayor’s Office and the Department of Correction, MDRC is designing the program and contracting with the Osborne Association and Friends of Island Academy to run the program and overseeing program implementation. Goldman Sachs is providing financing and Bloomberg Philanthropies is providing grant support for the effort. The Vera Institute of Justice will conduct an independent evaluation and release the results in 2016. Is a centralized governance structure a prerequisite for achieving large-scale improvement in community college student outcomes? Jobs for the Future (JFF) released a report last month that attempts to answer this question, drawing on the experiences of seven Michigan community colleges that have been involved in the Achieving the Dream initiative. The push to increase college completion rates in the U.S. has focused largely on a combination of institution- and state-level reforms to bring the most promising initiatives to scale as quickly as possible. Many states (e.g., Virginia, Washington and Kentucky) have developed more centralized governance structures in their community and technical college systems, which has helped to drive their reform efforts and spread them across each state. JFF argues, however, that “If centralized authority really were essential [to bring about systemic change], the student success agenda would be in peril. Few states exercise much direct control over their community colleges, emphasizing the ‘community’ role of these colleges by delegating authority to local and county government.” While the type of governance system clearly matters, even states with more decentralized systems can succeed in spreading reform. Michigan is a prime example of a state lacking centralized authority in its community college system. However, the state government and institutions of higher education there have been under pressure over the last decade to increase postsecondary access and success significantly. To drive their improvement and reform efforts, the state’s community colleges turned to private philanthropies for resources, focus and technical assistance. Seven Michigan community colleges were selected first to participate in Achieving the Dream (today, 17 of Michigan’s 28 community colleges participate in the program). Each college used its data to develop interventions tailored to its particular needs and challenges. While the degree of college autonomy in the state ensured a wide variety in reform proposals, most of the colleges focused their efforts on developmental education, improving the first-year experience of students, and/or building institutional capacity to support change. Such states often lack an agency with higher education policy expertise. They often do not have the mechanisms to support and sustain broad reform efforts. Their reform attempts rely almost entirely on the actions of forward-thinking leaders at individual institutions, making the momentum of effective innovations vulnerable. Activities that require coordinated efforts at the system level, such as advocating for more public funding, supporting peer learning across institutions, and aligning transfer and articulation standards, can be difficult to achieve. The experience of Michigan’s seven Achieving the Dream colleges was that implementing widespread reform entails a concerted effort within individual institutions as well as among peer colleges. In a decentralized system, outside support from philanthropies or other organizations may be necessary to push for improvement across multiple autonomous colleges and guide their efforts. And, yet, out of these first attempts at reform, Michigan’s community college leaders, private funders, and policymakers are now collaborating to address these challenges. Results from Achieving the Dream and other student success initiatives around the state have been drivers of meaningful collective action at the state level, such as the establishment of the Michigan Center for Student Success and the development of the Michigan Statewide Longitudinal Data System, along with other promising opportunities on the horizon.